Chocolate Eggs and Jesus Risen! My husband exhorted us this morning in his sermon that it is time for Christians to rev up the Easter celebrations because at His resurrection, Christ recreated the world. Therefore, Easter is the greatest, most cosmic-shaking event ever. So he suggested we make our Easter celebration even BIGGER than Christmas. You’ll have to listen to the sermon yourself if you want to follow his argument. But immediately after church many of us ladies were thinking about what we could do to make Easter more of a celebration in our families. I have great childhood memories of Easter. My mother always made (or bought) us girls a whole new Easter outfit. We had new shoes and a matching purse (usually white patent leather), lacy socks, a pretty new spring dress with a slip to go with it, and a hat. We were filled with anticipation. My dad always bought us girls (and Mom of course) a corsage. We colored eggs a few days before, and Easter morning we hunted down our Easter baskets and had a big Easter breakfast. After church Mom prepared a big dinner and the table was set with the crystal, china, and sterling. The candles were lit. And we were not by any means the only people doing this. Everybody got a new Easter outfit. My brothers wore suits and ties, even at age three. Everyone was feasting after church. And Dad presided at our table, praying and carving the meat. Sometime in the sixties or seventies we had a pietistic revolt against such things. I don’t know exactly where it came from, but it seemed more “holy” to ditch the Easter finery and treat Easter Sunday pretty much like all the other Sundays. In spite of the trend, I always tried to get our children new Easter outfits, though I didn’t always manage it as well as my mother had. I remember one year, when they were ages 1, 3, and 5, she made our three children matching sailor outfits! And we did all the egg coloring and hunting with our kids, as well as feasting on an Easter dinner. Today it is hard to find pretty spring dresses for the girls. But it can still be done. There is something really delightful about it. Jesus recreated the world; spring is coming and the world is waking up. We have left winter behind and look forward to spring. We change our dark heavy clothing for light cheery Spring colors. I believe it is a wonderful tradition to dress everyone in new clothes to celebrate a new world with a risen Lord. Now I realize that when the women all decide to buy Easter dresses for their girls (and themselves) there is the danger that some will go overboard. They will put their daughters in outlandish ruffles and bonnets and wear hats that are the size of Rhode Island. That kind of behavior is what prompted the last pietistic revolt. I understand all that. But certainly we can redeem this tradition and do it with humility and rejoicing and without competition or vainglory. And I am not prepared to promote hats….though I certainly don’t object to it. And as far as the eggs go, my daughter learned while she’s been in England that this tradition has a very practical beginning after all. Since the people didn’t eat eggs during Lent, and because the hens kept right on laying anyway, they had a big surplus of eggs by Easter. So, being keen on finding a good use for so many extra eggs, they turned it into a party and colored the eggs and hid them to delight the children. Children are still delighted by such things, and I say, let them be! What could our good God possibly object to if we want to boil, color, and hide eggs for our children? I never met a child who didn’t adore it! If you don’t have any Easter traditions yet, then go ahead and start some now. If it’s too much to do it all this year, then just begin with the food: a leg of lamb, a ham, or a turkey, and make it festive. Make some strawberry or lemon meringue pies. Or maybe you prefer carrot cake. At our house deviled eggs are a must, and Rachel and Luke bring the jello eggs to serve right along side the potato salad. The kids are enchanted. So there you go. I’ve given you my pep talk. Get ready for the big event. Whoop it up! He is risen indeed! It’s very timely for me to read this as I just bought supplies to make an Easter tree and baskets for the littles. My oldest is still under three, but we have no real Easter traditions of our own, other than all the Hicks boys wear matching shirts. I’m excited to try to “whoop it up” this year! Great sermon, Great post! Really enjoyed this post. We don’t have many Easter traditions yet, but I’m hoping to establish more this year. It’s amazing how time flies after you become a parent. With our oldest nearing three, I am realizing how important it is to get some traditions in place for her to have memories of later on. Any of you moms looking for spring dresses might want to take a look at Costco. Yes, they do have some nice clothing. Ours usually carries a large selection of Laura Ashley girl dresses in very feminine designs in the month or two around Easter. Thanks for the great suggestions. I think it’s sometimes overwhelming as a young mom to think of planning a big celebration on top of our day-to-day duties of looking after little ones and running a household. But, it’s good to start somewhere and I find it’s helpful to share the load with another family. I like the saying “Many hands make light work.” Share the preparation time and you’ll not only build friendships, but everyone can go home with some great treats. My suggestions: Get together with another young mom and dye Easter eggs, or plan a baking day so the kiddos can play and there’s only one mess to clean up. I’m struggling with how to make this special day memorable and significant this year. I’m expecting a baby any day now (due tomorrow) so I’m REALLY HOPING I will have a newborn by Sunday. Currently I have no umph to do something special with my 2 and 4 year old. Any suggestions?? As an “older” mom, here are a few ideas that we have traditionalized over the years. We invite over close friends of ours (we don’t have family close by) and usually another family, college students, or other loners. (This is where the invitation to families with newborns is much appreciated). We have a great dinner, which my friend helps to prepare (share the load). We sing before the prayer, eat (festive paper plates are great), have candy, and the highlight is the game playing. We have ping pong and fooseball tournaments, three-legged races (even in the basement if it’s unseasonable outside), and egg-on-a-spoon races (with painted eggs). Sometimes we do a craft, like painting flower pots and planting a flower in each pot. The new clothes add to the special celebration. We also hide chocolate. We gave our DIL money to buy the grandkids Easter clothes and we have a small present for them, too. Celebrations are about partying with others. Planning ahead, like for Christmas, helps, but it takes awhile to develop the habit. It took us years to come up with our “traditions”. We are so glad to have the happy memories and great pictures! When I was little, we weren’t allowed to paint eggs or have chocolate baskets at Easter because my parents considered it a pagan interpretation of Easter. With my own daughter, we delight in the celebration with all the extra trimmings. This year we are even able to take a short vacation for Easter! I appreciate your encouragement in our new endeavors. Thank you! Thankfully, here in California, our spring break coincides with the week after Easter. It helps in preparing a big celebration to know that it’s not back to the daily grind Monday morning! We get our boys new shirts and ties for Easter, but this year they have something special–they’re inheriting tie clips and cufflinks from their great grandfather that he got as a toddler. Unfortunately, with formality disappearing, my mom can’t find cufflink-type shirts for 2 and 3-year-olds anymore and is having them especially tailored! We used to have wonder Easter basket hunts. My mom would leave a clue beside my bed in the night (I was the oldest) and we’d follow a trail of rhyming clues until our overflowing baskets were discovered. I am not as good at writing clues as my mom, but I’m great at buying chocolate. We’ll have to see what we can do this year. One of my favourite childhood Easter traditions was decorating hard boiled eggs with my cousins then rolling them down a hill (the rockier the better) to see which egg cracked first! The rolling egg was symbolic of the stone rolled away from the tomb. We even peeled the shells and ate the eggs after the race. Chocolate? You think that Easter is about chocolate?! I am appalled. I never expected to encounter such heterodoxy on this blog. You clearly need a reminder of the true meaning of this holiday. 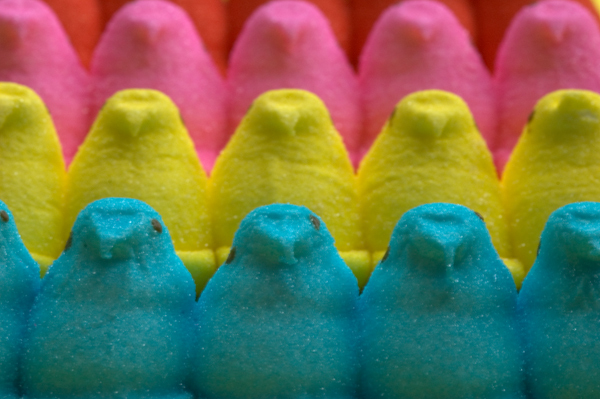 You’ll be relieved to know that I bought eight packages of peeps today, in a wide array of colors! Will that fix the problem? When we were first married we decided that we wanted to celebrate Easter with as much gusto as we did Christmas. It has taken a few years in the making to work out our own family traditions, but here’s what we’ve worked out so far…we buy the whole family new outfits, and fill the house with flowers to remind us of new life. We then plan a huge feast for Easter breakfast which Jonathan and I make and have all laid out for the children when they wake up. We then give them baskets filled with sweet things after our feast. We also hope to write down all the blessing of the past year and read them together to remind us of the Lord’s overwhelming goodness to us. We really look forward to this glorious holiday and start planning for it right after Christmas. Thank you! Thank you! Thank you! I grew up with all those English Easter traditions and loved them. Then, I married into a pious reformed family who doesn’t really celebrate at all. I have always dreaded spending Easter Sunday there, and haven’t been able to convince them that as Christians we are called to rejoice with more than just an extra church service. It’s nice to see other reformed people sharing my concern about the absence of joy in Easter. Thank you so much for the inspiration – and challenge!I’ve just glazed two dozen hot cross buns, fresh from the oven. We usually have a passover meal on the Thursday night, with pressies for the ‘kids’ and I have a chocolate mould of little lambs so I make white and dark choc. lambs that I package up with ‘Behold the Lamb of God …’ tags. Of course, down here in the ‘real’ south our Easter is at the start of autumn, not spring, and like Christmas, a lot of the traditions don’t quite fit. Wow, I am so excited to read all of this! I came to the website this evening hoping to find something on Easter celebrations because I’m having trouble with table centerpieces, and now my cup runneth over with fantastic Easter ideas. I also have very happy memories of Easter — of coordinating outfits for me and my siblings designed and sewn by my mother, of picking out black licorice jelly beans (eeew!) and sneaking them into my father’s basket, of standing over the sink scooping out Cadbury egg centers with our little fingers, of pounds and pounds of my father’s famous potato salad made with leftover Easter eggs (tinted blue and purple from all of the seeped-in dye). My mother even passed our Easter baskets down to us as adults, so now I can have my hoary-headed basket stand proudly next to my daughters’ shiny new ones. It may not look like much anymore, but it does tell a lot of stories. Nancy, thank you for reminding me how important all of this is. It’s too easy to let go of or downplay these traditions and get wrapped up in the many urgent matters of daily life. But traditions are so powerful. It’s almost as if we become more of a family every time we practice them. That being said… anybody have unique ideas for table centerpeices? I usually serve lunch from a long buffet, allowing space on the tables for something pretty to accent white linens and white with gold china. The problem is that I’m no good at flowers and we are strapped for cash. How about incorporating colored eggs into a centerpiece? If you have a longish table, strew a row of Easter basket grass down the middle and arrange the eggs on that — colorful and festive. (Paper grass would be nicer than plastic grass if you can find it.) If you have candles and candle holders, arrange the grass and place a few eggs around each. Winding some colorful pastel ribbons among the eggs would be a nice touch, too. And you could add some Easter candy…perhaps small chocolate eggs wrapped in pastel foils, or maybe those Cadbury mini eggs with the pastel candy coating. I actually use American moss instead of paper or plastic grass. I think it was a couple dollars at Michael’s. Also, I have blowing eggs over the years. I dye some and I wrap some with ribbon (which you can affix either with tape or glue…I use tape because I don’t have a glue gun). Candy is always a good idea on a table–the kids love it! Also, I just googled it to see what would pop up. Lots of ideas out there, though it can be a lot of time sifting. There were quite a few ideas on hgtv.com, though. I hope you find what you’re looking for. Our family has it easy this year, as another family from church invited us over for egg hunting, feasting, and general merriment. I just get to do my favorite part: dessert (coconut cake–which can be found at joyofbaking.com, my favorite site for foods), and bread (potato crescent rolls). This post has inspired me to find some lacy white gloves for the girls…it’s always in the back of my mind, but I invariably forget. I LOVE the idea of rolling the eggs down a rocky hill! We just happen to have a rocky hill, and that may have to be a new tradition for us! Just an FYI for you ladies still looking for Easter outfits, the JCPenney (here at least) has their children’s (I didn’t look for adult outfits) Easter dresses and suits marked at 50% off. Dad’s parents lived across the way from us, and their garden played host to the chocolate egg hunt. Grandma Jeanne’s North Carolina garden was always full of tulips just in time for her to secret tiny, gold wrapped eggs. Also, we got to walk through garden in our jammies and slipper socks. It is also a family tradition to eschew peeps and marshmallow eggs. Hey, can someone please QUICKLY share a good Hot Cross Bun recipe? Here in New Zealand it’s almost halfway through Thursday already and I am still lacking a good Hot Cross Bun recipe! When I make them with the recipe I have, they always turn out like little solid rocks, which can symbolise the stone rolling away, I guess, but I’d rather make and eat nice big soft ones! Wow! So many wonderful ideas! As a young child I HATED Easter. Both of my parent’s families live in my home town so every holiday meant juggling all four of us kids, plus the requisite food contributions, from one house to the next. All the food, cousins, socializing (I preferred my books) and so forth quickly became nothing but a chore and I don’t like chocolate or peeps anyway. However, when I was about 10, some friends who had just returned from working as missionaries in Israel invited us over for a Passover seder. The rich meaning and ceremony of the ancient traditional meal final allowed me to “get it” about what Easter was really all about. We instantly made this a family tradition and included brothers and sisters in Christ more often than immediate family. Since then, I have always loved Easter, not for the pretty new dress that I got most years, or the wonderful baskets that Mom still often prepares for us, but for the actual POINT of this Holy Day. We still hunted for eggs and made our selves sick on jelly beans. In fact, one of my most fond childhood memories is when Dad made each of us a little sign with our names written in animal letters and we followed our own color-coded trail of “Easter Bunny Poop” (jelly beans) to baskets that Mom had hidden throughout the house. Now, as a relatively new bride, my husband and I are struggling to establish our own traditions. But this is one from my family that we have been anxious to bring into our own. We don’t have children yet, but this year, we are celebrating the Passover at our house with both sets of our parents. If you have never been to a seder, or seen a demonstration of one, I strongly encourage you to seek out this information. Celebrating it yearly as we do certainly isn’t for everyone. And it is important for Christians to remember that we are not under the Old Testament pharisaic law in celebrating the ancient feast, keeping kosher etc. But this was the last meal that Christ shared with His disciples on earth. This is when He instituted Communion — and it is actually already built into the ceremony of a traditional Jewish seder! The Jews celebrate the miracle of the resurrected messiah every year — and don’t even know it! There are several excellent sources for messianic — or Christian/completed — Jewish traditions and information. We use the hagada (or “story book”) from http://www.messianicjewish.net and they also have great, Biblically sound resources for learning about all the Biblical feasts. Megan, looks like you’re set but I’ll email you later with some ideas. Fast through Lent with special family worship centering on this special season and leading up to Easter. Tom Wright’s (N.T. Wright) book: “The Scriptures, The Cross, And The Power of God” Reflections for Holy Week. We go through this book during Holy Week starting on Palm Sunday. EXCELLENT book, it has readings for every day of the week. NOT every year but sometimes we do a Christian Passover on Maundy Thursday. We do a Christian Sader meal where my husband explains to the family and any friends we invite all the symbolism and how everything pointed to Christ. The years we’ve done it, it has been very profound, the kids LOVE it, especially the part where they get to whip each other with green onions. 🙂 Friends of ours introduced us to this tradition a few years back. We have always attended a Good Friday service. Dye Easter eggs and cook and make all sorts of Easter goodies from different ethnicities around the world. My husband and I set out the kids’ Easter baskets right outside their bedroom door so they run right into them first thing in the morning. Each basket focuses on something special for that child. Sunday dresses, hats, purses, gloves and shoes the whole shebang. Wow, now that I have son I’ll have to start looking for some “little man” clothes. Huge Easter Feast with Lamb. Being middle eastern that is one of our traditions. We eat lamb for Easter symbolizing the Lamb of God that takes away the sin of the world. Spend the rest of the day enjoying family and or friends and basking in the Love of Jesus. I’m sure I may have missed something, but that’s basically what we do. I am always looking for ideas so I thank all of you women who have written. I LOVE the corsage idea!! Happy Easter everyone! May you celebrate it robustly, with the same vigor and love our Lord himself showed when He died and rose again that first Easter. Luma, tell us how you cook your lamb! I had planned to do an Easter Eve (Saturday night before) dinner, but postponed it to the following Saturday. I’m thinking I’d like to serve lamb, and I have a recipe I’ve used before, but I’d love to hear yours. I always get lamb at Middle Eastern restaurants, and it’s always the best! Thanks everyone for the table centerpiece ideas. One more idea I thought I could share is actually something we came up with last night on the spur of the moment, but are really excited to try. A few months ago I came across a fun little book by Eric Carle (of the “Brown Bear, Borwn Bear…” fame) called “Walter the Baker.” It is a fictionalized story of the invention of the pretzel. On the back page is a short description of the tradition of the pretzel, which happens to be Lenten in origin (I plan to research this one further). Apparently, the criss-cross in the middle of the pretzel is a symbol of penitence, of our arms being crossed in prayer as we bow before the Lord. So we have decided to do a pretzel craft with our daughters on Saturday. I bought a giant bucket at Costco, some melting dark and white chocolate, and lots of fancy suagrs and Easter sprinkles. We’re going to decorate the pretzels together, then hand them out to loved ones as an Easter gift. We’re really looking forward to it, so I’ll let you know how it goes! Hey y’all I just posted a bunch of my recipes and hit submit but I think they disappeared. Sorry, if I have time later today I’ll try to repost. I really appreciate this post. Since becoming a Christian I have always been rebellious about the idea of dressing up even more than you normally would for church on Easter. The reason being, it always seemed like people were using the day as an excuse to go buy knew things and then to try to impress people with what they look like. I admit as I write this that it seems kind of cynical that I would assume such things. Anyway, your explaining why we should dress up and even go buy something new was really helpful. I never thought about the whole dressing up thing in light of the awesome celebration it is to remember Jesus’ resurrection. I’m so sorry your post disappeared, Luma. How vexing after all that typing. Thanks for trying for us! If you do feel up to trying again at some point, and would prefer to do so less dangerous format, feel free to send me a Word file, and I could post it on my website and post the link here. My e-mail is valerie — at — kyriosity — dot — com. Valerie, I took your suggestion for a centerpiece and it was a hit! I got many compliments. Thanks for the help. I scaled it down a bit, just using tons of dark green grass and large metallic gold eggs because that sort of grand simplicity accented the stark white and gold of the china and linens very well. I even used little metallic eggs in dark shades of green, blue, gold, and pink for place cards. Yay! I’m glad I had a good idea…and gladder that you found a way to execute it that suited your tastes and your table so well.